The Standard Poodle is a squarely built and well proportioned dog breed. With proud carriage and elegant appearance, it moves with a springy, effortless gait. 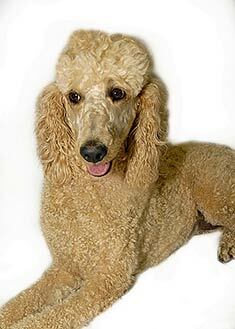 The Standard Poodle, being an extremely intelligent dog breed, is very easy to train and makes a great family pet. The name “Poodle” comes from the German pudelhund, related to the English word for puddle. Standard Poodles can be any solid color. Standard Poodles have frizzy or curly coats, which are dense and harsh. Regular grooming is required. The expected life span of the Standard Poodle is 10-13 years. Standard Poodles do well in homes with fenced yards because they are active dogs who enjoy exercise. The Standard Poodle is in the Non-Sporting group. No matter which size variety you choose, the Poodle is a wonderfully intelligent dog. Who knew they were originally bred to retrieve hunting prey from the water? In fact the name “Poodle” comes from the German pudelhund, related to the English word for puddle. They continue to be used in that role today and are also great sports dogs, used in agility, obedience, tracking, and even herding. Where did the Poodle come from? 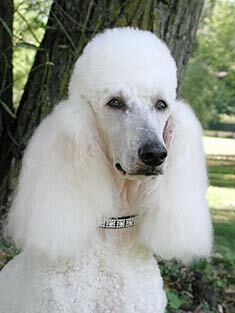 We’ve all heard the term French Poodle so much that most people assume that’s where the breed originated. In actuality, these dogs were developed in Germany during the Middle Ages, primarily for water retrieval of hunted prey. The dogs accompanied German troops into France, where they subsequently became the national dog of France. What does a Poodle look like? Most commonly, the Poodle has a solid-color coat, but in some cases, they appear parti-colored with large patches of a different color than the main body color. As a Standard Poodle ages, his color may fade or clear to a lighter shade, although the ears generally retain the original color fairly well. The tail is typically docked in the United States, although it is left longer now than it once was. A very short docked tail may be indicative of a dog purchased from a puppy mill. The Poodle is one of the few dogs that does not have an undercoat. His dense, curly coat doesn’t shed much, but does require regular grooming. The coat’s texture may range from coarse or woolly to soft or wavy. To keep a non-show Poodle’s coat in good shape requires clipping about every six to eight weeks, which can be done either at home or at a professional grooming salon. Other than that, brushing at home and the occasional bath are the only grooming you will need to do for your Standard Poodle. Show Poodles require constant vigilance and about 10 hours of grooming each and every week. There is some dispute as to the origins of the typical show style. Some say it comes from the French circus, where these dogs were clipped into an amusing style for entertainment purposes. Others say that the style allows the major leg joints to remain warm in cold water hunting, while the short clip around the body prevents water drag. In the United States, the most common show clip is the Continental. To create this look, the face, throat, feet, and part of the tail are shaved, as are the upper halves of the legs. Pompoms are left around the ankles, and sometimes around the hips, where they are called rosettes. Although rarely done because of the tremendous grooming requirements, a Poodle coat may be corded, as is done with the Puli. In this style, the fur is allowed to grow very long and is molded into something resembling dreadlocks. This coat is extremely difficult to keep clean, and takes at least overnight to dry after being washed. The tightly curled coat of the Standard Poodle causes dead hair and dander to be shed at a slower rate than for most other dogs. However, no dog is truly non-allergenic, as all shed at least a small amount of dead hair, dander, and saliva into their environments. Frequent bathing of any dog will reduce the amount of allergens released into the air and cut down on the size of any allergic responses experienced by his family members. How are the different sizes of Poodles distinguished? The Standard Poodle is essentially the same dog as the miniature or toy variety, except for height. Dog height is measured at the withers, or the highest point on the dog’s back when he is standing. It would be most analogous to the shoulders of a human. According to the American Kennel Club standards, a Standard Poodle has withers over 15 inches high, while a miniature stands between 10 and 15 inches. Anything under 10 inches is considered a Toy Poodle. An adult Standard Poodle should weigh between 45 and 70 pounds. Some breeders refer to their dogs as royal standard, teacup, or tiny teacup, but these are not varieties recognized by any major kennel club in any country. Buyer beware of a breeder marketing dogs under these names. In fact, the teacup and tiny teacup are usually the unhealthiest “runts” of any litter, selectively bred for smaller size which may indicate physical weakness and tendency towards genetic diseases. Is the Standard Poodle good with children? The sweet-hearted poodle is very people-oriented and doesn’t usually become bonded with just one member of the family. Poodles are also accepting of other animals in the household, and may even be protective of smaller dogs! They enjoy people of all ages, doing their best to please their human companions. For this reason, they are fairly easy to train. The breed is very energetic, so prospective guardians should be sure they can provide proper exercise for a Poodle before taking one in. These athletic dogs love long walks and play sessions. This, coupled with their high intelligence, makes them prime candidates for some of the sporting events in which dogs may become involved such as agility, lure coursing, or dock diving. The Poodle is one of the most frequently cross-bred dogs because people often assume that breeding a low-shedding dog such as the Poodle with another breed will produce a breed that is also low-shedding. This may or may not be a good strategy, as you never know exactly which proportion of which genetic material will be present in the pups. Some of the most common cross breeds are the Cockapoo, comprised of a Cocker Spaniel and Poodle cross, and the Golden Doodle, made by crossing a Poodle with a Golden Retriever. What diseases plague the Standard Poodle? Although Poodles are basically healthy, living on average 11 – 15 years, there are some diseases which commonly occur in the breed. Some of the biggest issues reported to the Poodle Health Registry in 2007 were Addison’s disease, bloat, epilepsy, and sebaceous adenitis. Addison’s disease is tough to spot because its symptoms are so general. The dog may become tired easily or may have frequent stomach upset or intolerance for stress. The condition is caused by a problem in the adrenal cortex, whereby important hormones are not produced in a large enough quantity to serve the dog’s body. This can cause an imbalance in the dog’s sodium and potassium levels which is fatal without treatment. However, the good news is that medication allows the dog to lead a normal life. Bloat, also known as gastric dilatation volvulus or GDV, results when an excessive amount of gas builds up in the dog’s stomach and causes the stomach to twist. Immediate surgical intervention is required to untwist the stomach and pin it to the abdominal wall to prevent future occurrences. If you notice your dog pacing and retching without bringing anything up, you should immediately take him to the vet or emergency clinic for evaluation. Epilepsy is associated with recurrent seizures, but cannot be linked to a specific cause. It usually strikes between the ages of one and five years and is treated with Phenobarbital. Sebaceous Adenitis is one of the few skin problems seen in Poodles. Normally, sebaceous glands produce oils which keep the dog’s skin from drying out. When adenitis strikes, the sebaceous glands become irritated and then die, causing the dog’s skin to become scaly. The hair around the affected glands may fall out. This disease is most common in apricot-colored dogs. Is the Standard Poodle the dog for me? If you are looking for a dog with low grooming requirements and minimal shedding, who is great with kids and other animals, the Poodle may be just what you are looking for. Taking into account the size of your living space will help you to choose between the standard, miniature, and toy varieties of the breed. Find Standard Poodle Puppies with our Free Breeder search!